Darkness creeped across the land, the midnight hour was close at hand; when 30 slightly weirded out kids(after seeing our costumes!) joined us for our Scary Holiday Storytime at Cronulla. Our hosts for the day were Cheryl the witch and Debbie the vampire. Scary stories were told, scary songs were sung, eyeballs and spiders were flying across the room into big, green monster hands, much to the kids enjoyment! The huge bright orange pumpkin piñata was a massive hit and it took many massive hits by the kids to finally break it open and cause a cascade of lollies to fall to the ground! Everyone also enjoyed making the bouncy bat craft with the parents getting into the fun as well. 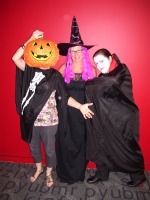 It's spooky time at Miranda Library! 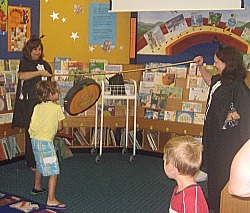 On the morning of Monday 10th January many children visited the library for some spooky school holiday fun! The children were greeted by a friendly, good witch and played games, listened to stories, sang and made a creepy bat craft. Many of the children came appropriately dressed as witches and wizards and a great time was had by all. Picture if you can ... a bunch of giggling children under a giant, white, ghostly sheet, a "time Warp" dancathon, the telling of scary stories ... and much more. 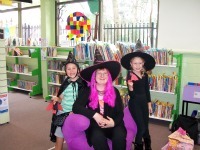 Children attending Spooky Time Fun at Engadine library (hosted by two friendly skelteons) were pleased by the guest appearances from Morticia Addams, several witches, Spiderman and a fairy or two as well as a variety of enthusiastic children. The pumpkin pinata was a huge "HIT" - pun intended - with our attendees enjoying the opportunity to let off some steam without guilt or consequences! For more information on upcoming activities please contact your local library or see What's on on the library website.